Listen up New Yorkers! Want a great weekend trip getaway idea? How about checking out the town of Beacon. It's only about an hour and twenty minute drive from the city, and it's a cute place to check out for an afternoon. I've told you before about the town of Cold Spring (very close to Beacon)...click here if you didn't read my post on it. Last weekend, I met some friends for breakfast in Cold Spring and afterwards, decided to see what Beacon was all about. If you take Metro North, Cold Spring is the stop right before Beacon, so my recommendation is to check out both towns when you head up north. There are restaurants, coffee shops, art galleries and boutiques up and down Main Street in both Beacon and in Cold Spring. WHERE TO EAT: Max’s on Main (246 Main St; 845-838-6297), Homespun Foods (232 Main St; 845-831-5096), and Beacon Creamery (134 Main St; 845-838-6233) are all supposed to be very good. WHERE TO STAY: Beacon is not a big-hotel kind of place: There aren’t any. However, there are some B&B's like Mt. 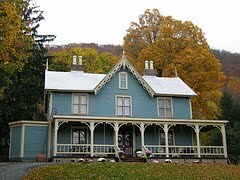 Beacon B&B (829 Wolcott Ave; 845-831-0737, $165–$195 per night). Or you can try the Swann Inn (120 Howland Ave; 845-234-3204, $157–$187.50 per night). You can also stay at one of the places I recommend in Cold Spring instead. HOW TO GET THERE: Take the Metro-North Hudson Line to Beacon Station. Take the Metro-North Hudson Line to Beacon Station; the 80-minute ride tours you through some of the Hudson Valley’s most scenic landscape. A round-trip ticket costs $24.